Scientists have for the first time shown how a single molecule expressed in the brain affects how we learn new tasks and acquire new memories. The discovery has profound implications for understanding why some older people, including those living with dementia and those with neurodegenerative conditions such as Alzheimer's, struggle in remembering recent facts (short-term memory) and adapting to new tasks. The findings, published in the journal Neuron, are led by Dr. Sonia A.L. Correa from the University of Bradford and Dr. Angela M. Mabb from Georgia State University in the US and in collaboration with Dr. Mark Wall from the University of Warwick. They mark an important breakthrough in understanding the mechanisms in the brain that control cognitive abilities. The team already knew the importance of the protein Arc in learning and memory. Arc is a key protein in enabling synaptic connections and is switched on during learning and, when no longer needed, switched off rapidly. They suspected that alterations in how Arc functioned would affect such cognitive abilities. To test this, the team created a genetically modified mouse that expressed a mutated form of Arc that only switched off slowly, but was otherwise behaviourally normal. The mouse was then compared with a normal mouse in its ability to solve a maze, escaping at a certain point. Both mice were able to solve the maze and locate an escape hole. However, when the hole was moved to a new location, the normal mouse was again able to solve the problem rapidly and after discovering the hole's new position, could go straight to it on each successive occasion. However, the modified mouse had to rely each time on a serial strategy, going through every step to find the hole. To make an analogy imagine you are staying at a hotel for a couple of weeks. After the first week, the manager changes your room but he won't tell you where your new room is located. To find your new room, you would have to test your key in each door until it opened your door. However, once found, the next time you returned to the hotel, you would be able to locate your room more quickly using a series of spatial cues that could include which floor your room was on, how far your room was from the elevator, and whether it was located near a fire exit. Imagine instead a situation where each time you returned to the hotel you had to keep trying the key in each room door to find your room. This inability to adjust your strategy to find the location of your new room is known as cognitive inflexibility and, as we age, this altered behaviour occurs more frequently. More importantly, this type of behaviour is observed during ageing and in some forms of neurological conditions including Alzheimer's disease. 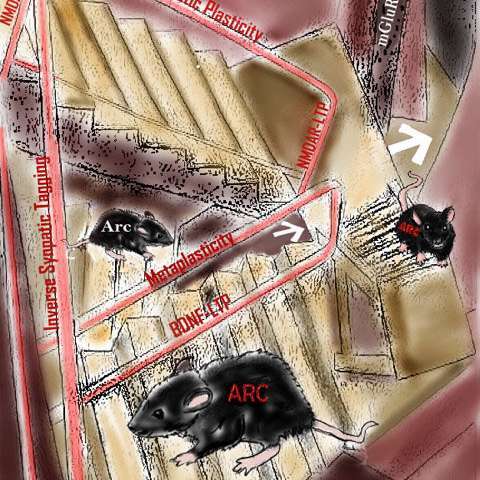 This alteration in behaviour (cognitive inflexibility) was observed in the mice with the mutated Arc protein, whereas mice with the normal protein could use the spatial cues. This study highlights the importance of Arc in learning and memory but also demonstrates that proteins have to be switched on and off at the correct times to function properly. This study has given us the first clue about the molecular mechanism to reverse a learning process and to layer new information onto previously learned information. Dr. Sonia Correa, from the University of Bradford, said: "These findings show that activity of a single molecule controls a critical aspect of learning and memory process, which is the ability to reverse a learning task. Remarkably, this molecule is not implicated on the learning process itself, but rather on the reversal learning. As such these findings give us hope to develop specific therapeutic drugs aimed to delay deficits in reversal learning that is believed to cause the early loss of memory that occurs in ageing and neurodegenerative diseases." Dr. Angela Mabb of Georgia State University said: "It's scary to think that the abnormal removal of one single protein [Arc] in the brain can cause this type of altered behaviour. We are currently conducting new experiments in the lab to look at this more closely with the goal of identifying novel drug targets for neurological conditions like Alzheimer's disease, which are known to have cognitive inflexibility."